Tech workers sat shoulder to shoulder with janitors and security guards on Monday night to address the plight of Silicon Valley’s so-called invisible workforce — the contracted service workers who clean, maintain and guard wealthy tech companies’ facilities for minimum wages and little recognition. 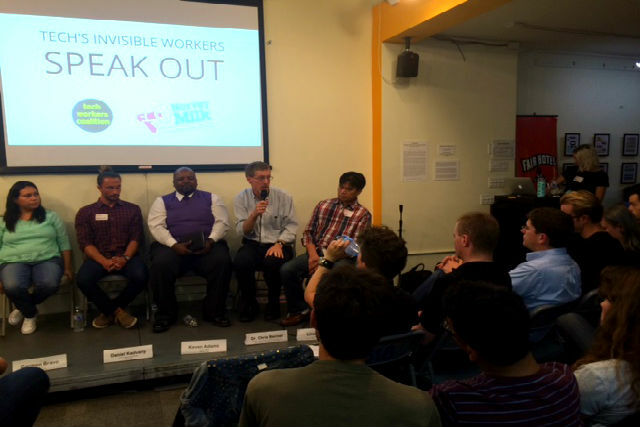 The panel discussion was hosted by the Tech Worker’s Coalition and the Harvey Milk LGBT Democratic Club at 518 Valencia St., filling the modest gallery and community meeting space to capacity. In a presentation given by panelist Dr. Chris Benner of U.C. Santa Cruz, the negative impact of Silicon Valley’s extreme wealth and its unequal disbursement was undeniable: statistics point to an increasing income gap, a disappearing middle class, stunted job growth and lack of affordable housing. “Silicon Valley is the epicenter of a new work regime that is spreading around the globe and everyone is looking to us to figure out what to do about these challenges,” said Benner. “There is a lot of turnover in the industry, even for people in regular tech positions — the economy is shifting,” said Benner, pointing out that despite rapid economic growth from 1999 to 2014, Silicon Valley had zero net job growth. “There was growth in wealth without benefits for the majority of population,” he said. Despite sobering statistics, it was the testimonies of workers supporting tech in day-to-day operations that illustrated the struggle of two intersecting communities that could not be further apart. “I’ve been bouncing around with a lot of different companies. When I got pregnant, I couldn’t afford health insurance. I had to turn to the state and that was pretty tough,” said Carmen Bravo, who currently works as a security guard on Huawei’s Silicon Valley campus. Bravo accused many of the companies that have employed her of shorting her of pay and time-off hours. Kevan Adams, a union security guard for ABM security has had similar experiences. While Silicon Valley’s systems and applications software developers reportedly earn annual median wages upwards of $60,000, the tech industry’s contracted and largely full-time maintenance workforce is making less than one-fourth of that, according to experts. Benefits for tech firm workers include free childcare, complimentary meals and special shuttle services — but these services are not extended to the contracted maintenance staff. “As a security guard, I don’t get a promotion or vacation time,” said Bravo. On top of gaping wage disparities, Adams described a sense of fear among the Silicon Valley’s service workers. “You go into work praying that you don’t say the wrong thing to the wrong person and lose your job,” he said. Panelist Daniel Kadvany is the product marketing manager at BitTorrent. The 27-year-old confirmed a lack of diversity in tech’s core workforce. “You see a lot of white men,” said Kadvany. Some companies that have disclosed data on their workforce include Facebook, Twitter, LinkedIn, Yahoo, Google and eBay – revealing that only 3 to 4 percent of their U.S.-based tech workers were black or Latino. At the end of the forum, attendees and panelists discussed solutions — and some recent victories — in the struggle for equality in Silicon Valley’s workforce. It’s not “income” inequality, it’s skills inequality…. Horsesh____, it’s institutional racism, sexism, and greed. Ugh. The people who wait on others in trendy restaurants, toss garbage cans filled with empty $6 coffee cups, and shuttle the mostly high paid tech work force need to make a LIVING WAGE. Also, read the article. Again. No one in this article is saying these folks want to be paid as much as a Director of Engineering. Your comment is just another in a long line of entitled responses that gloss over what this sector of society needs and is asking for. Decent pay. Sick time. Vacation. Respect. These companies have the money to pay them. Should it pay more to serve coffee to tech workers than to some other profession?